STEVE EMBER: I’m Steve Ember. BARBARA KLEIN: And I’m Barbara Klein with EXPLORATIONS in VOA Special English. 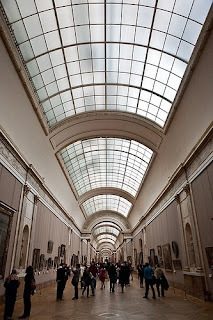 Today we travel to Paris, France, to visit one of the most famous and most visited art collections in the world. From the twelfth to the eighteenth century, the Louvre was the home of the ruling families of France. In seventeen ninety-three the Louvre became a national museum to house the country’s treasures. The thirty-five thousand works of art in the museum represent thousands of years of human culture and come from all over the world. STEVE EMBER: One of the most striking ways to begin a visit to the Louvre Museum is to start in its central courtyard. This is an area where past and present building traditions meet. On three sides, you are surrounded by the museum’s carved stone walls. In the center of the courtyard, there is a huge glass and steel pyramid surrounded by water fountains and smaller pyramids. This modern addition was designed by the Chinese-American architect I.M. Pei. You can enter the glass building and walk downstairs to an underground visitors center. BARBARA KLEIN: The next decision is which area of the huge museum to explore first. It would take days to fully explore the museum. So we will have to settle for a few favorite works. 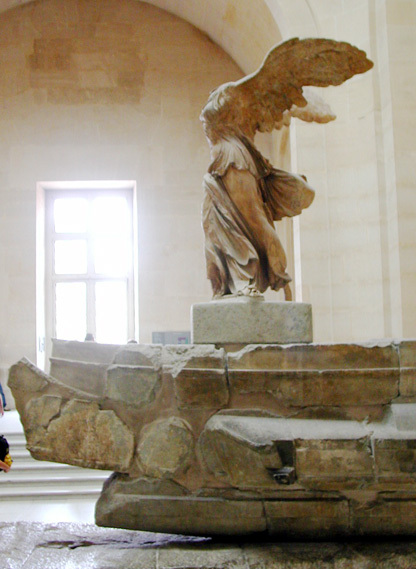 We will explore works from the three parts of the Louvre -- the Denon, Richelieu, and Sully wings. First, we stop to see one of the most famous sculptures in the world. 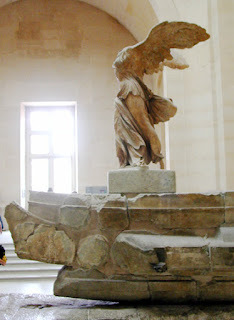 It is called the Winged Victory of Samothrace. This sculpture takes the form of a woman with wings. But this is not just any woman. This is the Greek goddess of victory. She is standing on the front of a ship facing the strong island winds. The artist carved her flowing clothing with such detail it is hard to believe she is made of stone. Experts believe this statue was made by the people of Rhodes about two thousand two hundred years ago as a religious offering to honor a naval victory. STEVE EMBER: Nearby, there is another famous Greek statue of a woman. The Venus de Milo was made about a hundred years after Winged Victory. This marble statue is widely believed to be the goddess of love and beauty. The work was named after the island of Melos where the statue was discovered in eighteen twenty. This Venus wears nothing but a cloth draped over her curving waist and legs. She is easy to identify because she is missing both arms. The statue is somewhat mysterious. Experts still do not know what identifying objects those arms might have once held. BARBARA KLEIN: Visitors to the Louvre can watch the evolution of Renaissance art by looking at several hundreds of years of Italian paintings. The Italian artist Giotto painted “St. 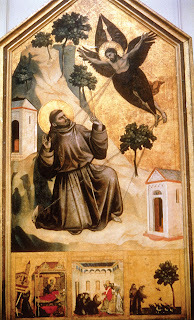 Francis of Assisi Receiving the Stigmata” in thirteen hundred. Giotto painted St. Francis in a way that shows his very human emotions as he goes through an intense religious experience. Giotto explored how to represent three dimensional space using light and shade. His methods influenced later generations of artists. 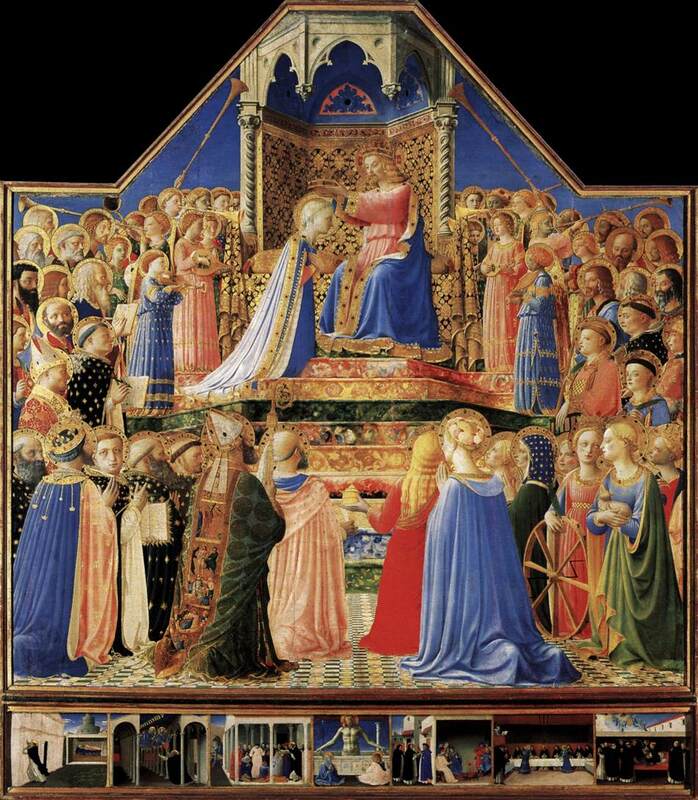 STEVE EMBER: The artist Fra Angelico painted “The Coronation of the Virgin” about one hundred and thirty years later. It was made for the central area of a religious center. The painting shows Jesus crowning his mother, Mary. To help express the wonder of this moment, Fra Angelico filled the work with light and gold. Other paintings show important political leaders and events. For example, Paolo Uccello’s fifteenth century work, “The Battle of San Romano,” shows the intensity of war. BARBARA KLEIN: It is hard to miss the crowds of people always gathering in one room on this floor. They have come to see what is arguably the most famous painting in the world. 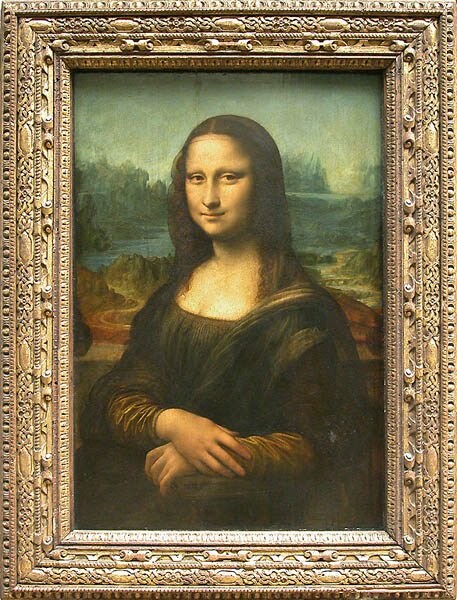 It is Leonardo da Vinci’s “Mona Lisa.” Created around fifteen oh three, this is a painting of an Italian woman named Lisa Gherardini. She was the wife of a businessman from Florence named Francesco del Giocondo. It is from him that the painting takes its other name, “La Gioconda.” The woman is sitting in a chair, looking directly at the painter. Behind her is a dreamy landscape. Experts still do not know much about this woman and her famous smile. They do not know why da Vinci painted it, or how it ended up in the collection of French ruler Francis the First. But the painting’s realism and mystery have captured the attention of viewers for centuries. STEVE EMBER: For a lesson in French history, we turn to the seventeenth century Flemish painter, Peter Paul Rubens. The queen of France, Marie de Medici, hired him to create a series of twenty-four paintings. These huge and colorful paintings make a political statement about her rise to power. 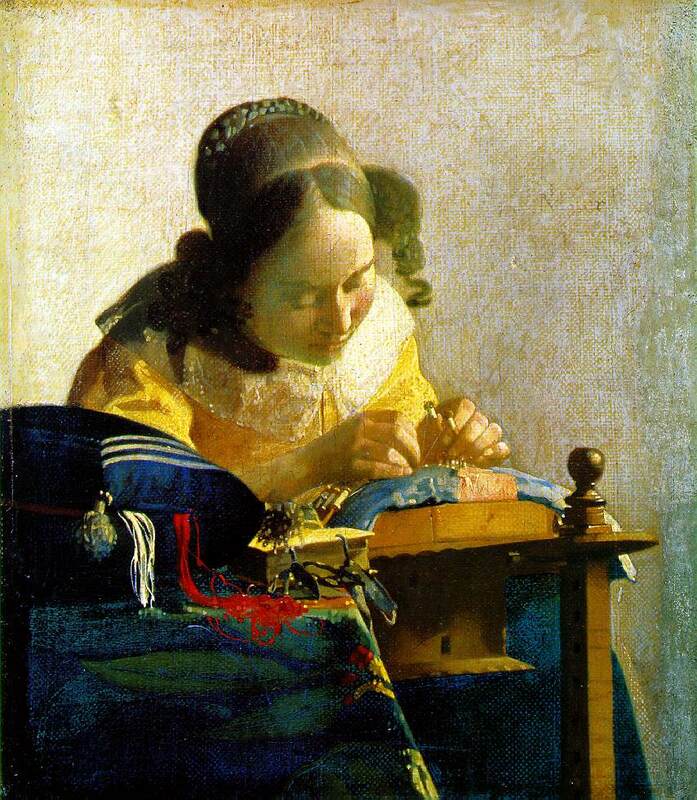 “The Lacemaker” by Johannes Vermeer provides a more peaceful and personal example of Dutch art. Painted around sixteen sixty-nine, this small work shows a woman quietly at work making lace. The artist’s method of capturing the effects of light is masterful. BARBARA KLEIN: We cannot visit a French museum without exploring examples of French art. First, we catch someone lying. Georges de la Tour painted the emotionally expressive “The Cheat with the Ace of Diamonds” in sixteen thirty-five. It shows four people playing cards, and one person is not playing fairly. We move on to several paintings from the nineteenth century period known as Romanticism. “Liberty Leading the People” is an important work by Eugene Delacroix. This huge painting shows the artist’s representation of a political uprising in Paris in eighteen thirty. Liberty takes the form of a strong woman holding the French flag. She is guiding the French people to fight. There are dead bodies, smoke, and the buildings of Paris in the distance. STEVE EMBER: “The Raft of the Medusa,” painted in eighteen nineteen, is an emotional work by Theodore Gericault. The subject is based on real events. The painting shows a group of sailors struggling to survive on a floating raft after the sinking of their ship, the Medusa. They are wildly motioning to a ship in the distance. But they seem to know that death will soon mark their future. This work was disputed at the time. Many people believed art should only show beautiful subjects. But others praised the work for its political message and modernity. BARBARA KLEIN: Jean-Auguste Dominique Ingres’ painting “La Grande Odalisque” shows a beautiful woman wearing no clothes. She has turned her long curving back to the viewer. She looks over her shoulder in a sensual way. STEVE EMBER: We continue our visit to the Louvre with the huge collection of art from ancient Egypt, Persia and the Middle East. “The Great Sphinx of Tanis” from ancient Egypt dates back over four thousand six hundred years. This stone statue has the body of a lion and the head of an Egyptian ruler. It expresses a sense of permanence and solidity. Another famous ancient piece is the “Law Code of Hammurabi, King of Babylon.” It is almost four thousand years old. This piece of basalt rock has been cut with words in the Akkadian language. It is one of the oldest collections of laws in human history. BARBARA KLEIN: Two four-meter-tall sculptures stand guard on either side of a door. They are winged bulls with human heads. The sculptures are over two thousand years old. They came from a home built by the Assyrian ruler Sargon the Second in modern day Iraq. The Louvre’s rich collection of Islamic art will soon have a new home. 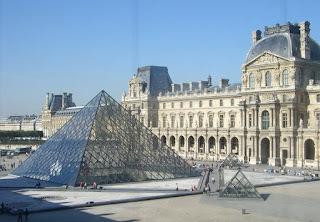 Prince Alwaleed bin Talal of Saudi Arabia donated twenty million dollars to build a new exhibit area within the Louvre. It is expected to open in two thousand twelve. STEVE EMBER: For the most part, the Louvre museum’s collection does not extend past works made in the mid-nineteenth century. But the Louvre recently made a special exception. 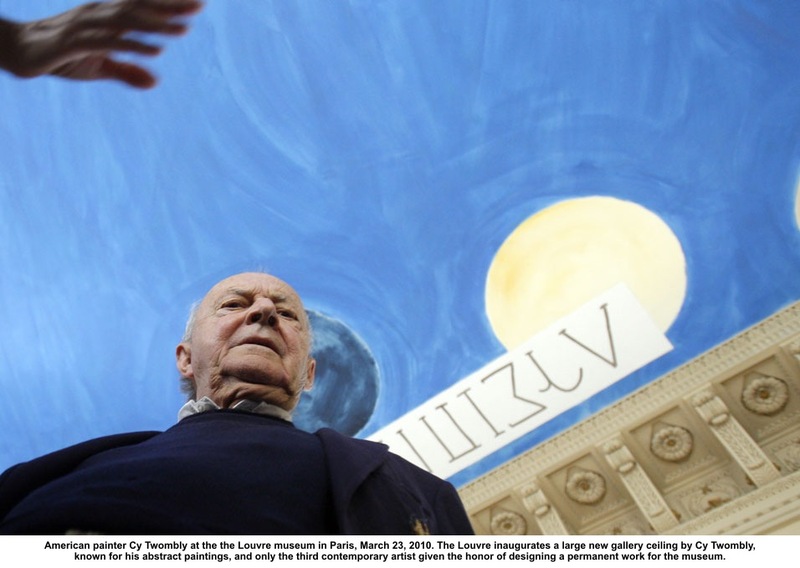 The American artist Cy Twombly is one of only three modern artists who have been asked to make a permanent piece of art for the Louvre. His work covers over three hundred fifty square meters of ceiling in a room that contains treasures from ancient Greece. The painting is like a bright blue sky with floating circular shapes on its edges. Mr. Twombly wrote the name of ancient Greek artists in Greek letters. His aim was to honor the skillful work of ancient Greek sculptors. His painting and the Louvre Museum show the importance of celebrating art’s past and its present. BARBARA KLEIN: This program was written and produced by Dana Demange. I’m Barbara Klein. STEVE EMBER: And I’m Steve Ember. You can see pictures of some of these works of art at our Web site, voaspecialenglish.com. Join us again next week for EXPLORATIONS in VOA Special English.